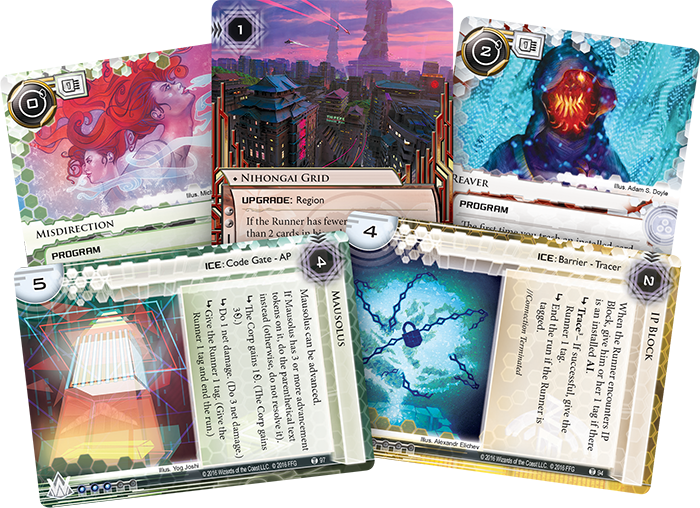 Fantasy Flight Games is proud to announce the upcoming release of Martial Law, the fifth and penultimate Data Pack in the Flashpoint Cycle for Android: Netrunner! New Angeles has plunged into chaos. Its citizens are trapped in their arcologies or huddled together in whatever safe places they can find. The city's streets have become a warzone. And if the corps can't or won't restore order, then the time has come for the U.S. government to intervene. "This is my USMC-XOB32. There are many like it, but this one is mine." 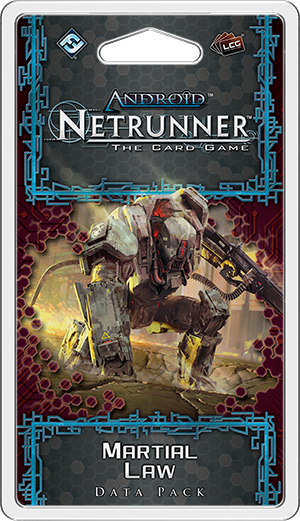 There are many ways in Android: Netrunner for the titular Runners to disrupt the plans of the megacorporations against which they run. 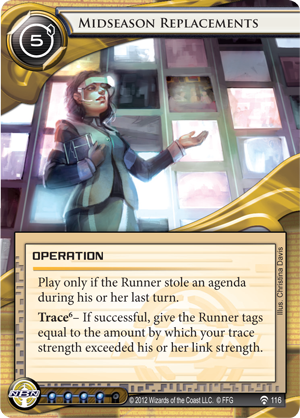 In fact, these disruptions (and the Corp's efforts to work around them) are pretty much the core of the game, and much of the Runner's work is to find the best combinations of tools and craft a strategy that lets him or her use those tools for maximum disruption. In Martial Law, all of the game's Runners gain valuable access to a new tool with which they can immediately begin mucking things up. 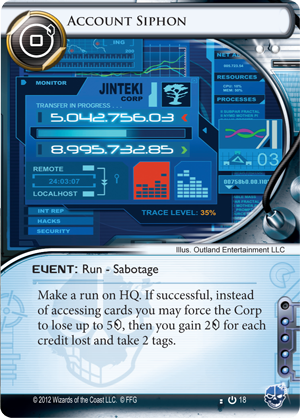 Interdiction (Martial Law, 87) is an event that plays for just one credit and prevents the Corp from rezzing non-ice cards on the Runner's turn. And because it's a current, it stays in play until the Corp scores an agenda or it is replaced by another current. The ramifications are significant. 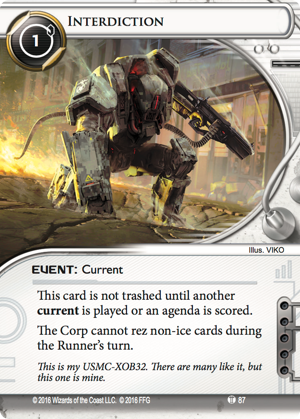 It means that while the U.S. military is locking down the streets of New Angeles and keeping tabs on the corps and their servers, the Runner won't face any surprises except for those presented by the Corp's layers of ice. 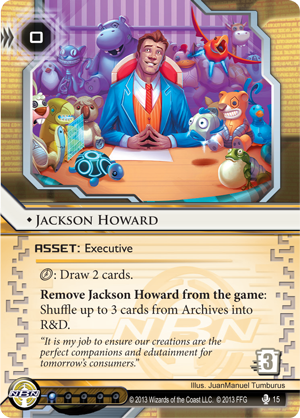 Jackson Howard (Opening Moves, 15) can't be rezzed to talk his way out of trouble and shuffle the Corp's agendas back into R&D during your run on Archives. 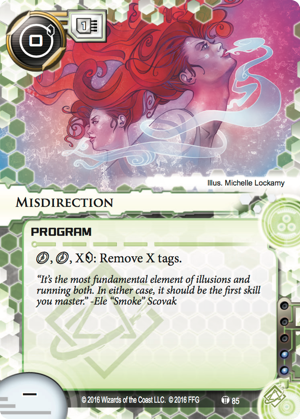 You're granting your rig a measure of immunity to the surprises presented by Keegan Lane (Data and Destiny, 24) and Will-O'-the-Wisp (The Spaces Between, 32). 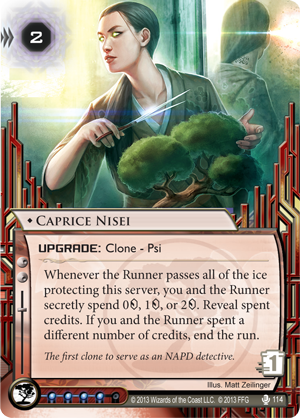 Even Jinteki's talented Caprice Nisei (Double Time, 114) will not be able to appear and thwart your run at the last possible instant. 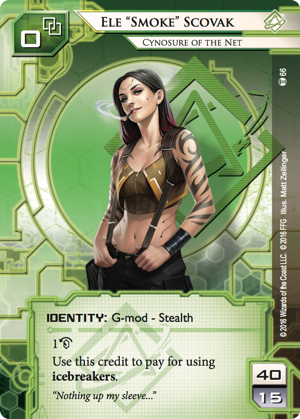 And, of course, even while Martial Law and Interdiction allow you to ignore many of the surprises the Corp might have intended to use against your runs, you'll still be able to use all your new tricks against the Corp. You'll find icebreakers that can leap into play from your heap, cards to let you shed your disguises and avoid tags, and a couple of the "illusions" employed to great effect by the Shaper Ele "Smoke" Scovak (Intervention, 66). 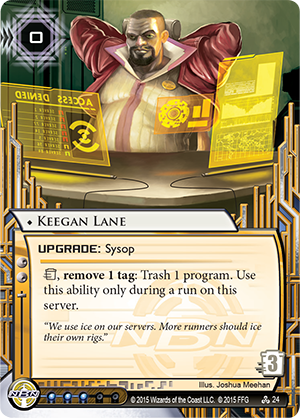 Some basic Misdirection (Martial Law, 85) makes it easier to shed the mass of tags you might suffer while running an Account Siphon (Core Set, 18) or when NBN comes after you with its Midseason Replacements (Future Proof, 116). 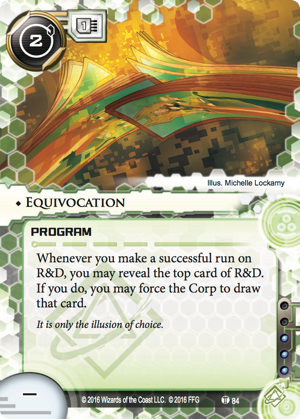 And during a run on R&D, you can give the Corp the idea that you're about to access the top card before using Equivocation (Martial Law, 84) to reveal it, hand it to the Corp, and access the next card instead. "I don't get paid to be calm." Even if the U.S. military is going to start limiting the authority of the world's biggest megacorps, and even if those corps suddenly have to play "fair," you can bet that they are still going to find new ways to manipulate things in their favor. Indeed, even if the restoration of order in New Angeles doesn't quite lead to the exact form or order that any of the corps would have desired, it still leads to a future that's more stable, more predictable, and—likely—more profitable. Under Martial Law, the corps can shift their focus away from chasing after those responsible for their losses—whether that means runners or other corps—and toward securing their newest plans for the future. 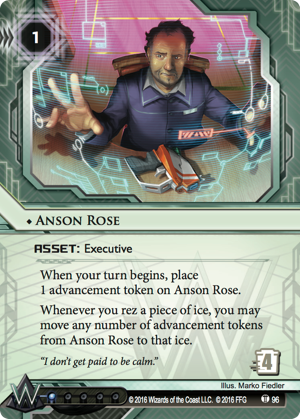 Accordingly, you'll find a whole host of steadfast new ice to safeguard your Corporate designs, along with a number of other cards to further safeguard your servers and discourage fateful intrusions. And while Martial Law may force the Corps to show a bit more outward compliance, these new pieces of ice still echo much of the desperate corporate aggression on display throughout the Flashpoint Cycle. 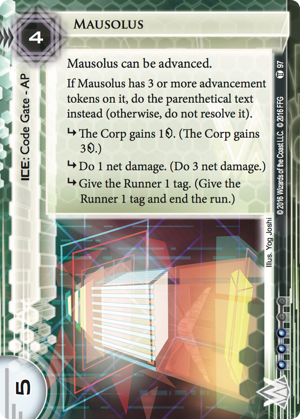 For example, Weyland's Mausolus (Martial Law, 97) not only rewards the Corp for its investment in the code gate, but it also damages and tags any runner unable to break or bypass its subroutines. 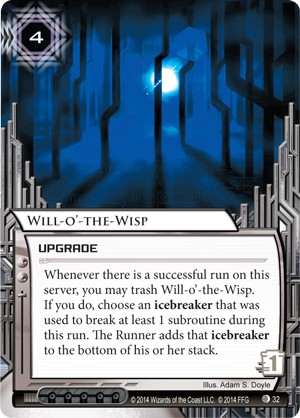 And because Mausolus, like each of the ice in the Data Pack, plays into the more aggressive side of its faction's core identity, it becomes much more imposing when it has been advanced at least three times. Will advancing your Mausolus three times allow Titan Transnational Bank's junior-level executive Anson Rose (Martial Law, 96) to relax a little? Not likely. Given the sort of trouble in which Titan Transnational finds itself, he's likely to remain on edge, but once he's helped advance your Mausolus, he'll at least be able to direct his attention toward your next project. And if that's only a little foward-looking, it's still a great deal less reactive than the corps found themselves just days earlier. …Plus, it's the show of order that counts. 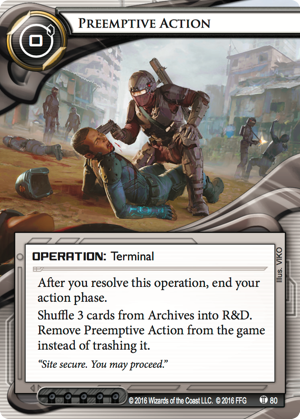 You can still direct your PriSec units into plenty of Preemptive Action (Intervention, 80); you just can't let them get caught while the U.S. military is sitting outside your office door. It may not yet be clear what the future holds for New Angeles, but it's clear that there are likely to be some monumental changes. Many of them will depend upon how the game's Corps and Runners respond to the implementation of Martial Law. What will you make of the military's temporary rule? You'll soon have your chance to find out. Martial Law is scheduled to arrive at retailers in the fourth quarter of 2016!